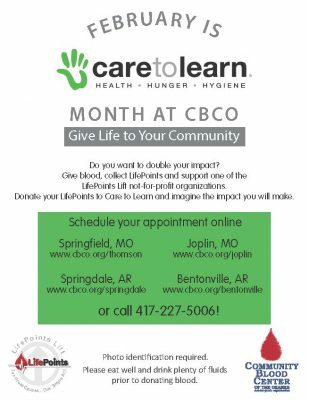 February 2019 is Care To Learn month at Community Blood Center of the Ozarks! We’re foc using on each of our 10 non-profit LifePoints Lift partner agencies throughout the year, to help educate the public on the vital work that they each perform. It’s a great way to help two non-profits at the same time — CBCO with your lifesaving gift of blood and Care To Learn with your LifePoints which allow the organization to make sure more students will have access to immediate funding for health, hunger, and hygiene needs so they can stay in school and be successful. You’ll receive LifePoints for your donations all year round, and you can give your LifePoints to one of our agency partners at any time. Not just in February. But February is our time to share information about Care To Learn. Care to Learn was founded by Springfieldian Doug Pitt in 2008, after he learned statistics that disturbed him about children living in poverty in Springfield, Missouri. He heard stories of children who were not having their basic needs met at home. Needs such as toothbrushes, shoes and clothing, personal hygiene products, food, and medical and dental care. Can you imagine how difficult it is to concentrate and get your schoolwork done when you’re worried about the most basic things in life? To learn more about Care To Learn, click HERE. Founded in 1995, CBCO has grown to serve 40 counties in three states and is the sole supplier of blood and blood products to more than 40 hospitals in southwest Missouri, northwest Arkansas, and southeast Kansas. More than 60,000 donations of blood acquired each year to meet the transfusion needs of our friends and neighbors. We at CBCO take the responsibility of providing that blood very seriously.